Shop Artificial Christmas Trees by Height. All of our trees are measured from the base of the included tree stand or pot to the top of the tree. 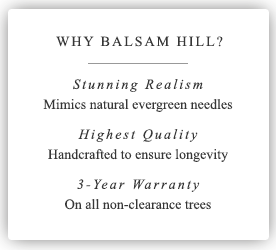 Whether you are decorating the tiniest London studio or a grand mountain home, Balsam Hill™ has the tree for you. The following are a few suggestions and tips that may help you choose from our selection of quality trees ranging in size from 4 feet to over 15 feet.